16 radish leaves recipes | Mooli ke patte Indian recipes. Radish leaves are long, green coloured with stems. These are edible and have a crunchy texture with a peppery hot flavor. Called Mooli ka patta in India and used in sabzi, parathas, kadhi. Though the hotness of the radish leaves varies from mild to very strong, depending on the age and type. 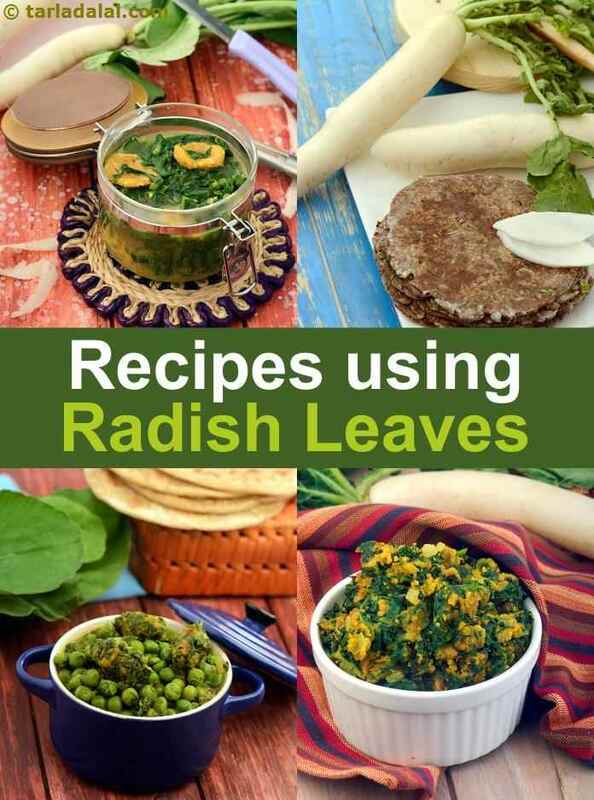 Enjoy our radish leaves recipes | Mooli ke patte Indian recipes below. Crunchy health packet is a healthy and appealing salad recipe with simple ingredients straight from the farm and choicest seasonings and dressings. Learn the trick to prepare the best tasting salad recipe at tarladalal.com. Garden leaves, delicious recipe involving garden greens like amaranth leaves( chawli) with dried spices. The leaves are rich in nutrients and make for a healthy vegetable dish which van be served with curd and rotis. This recipe contains the nutritional properties of both moong dal and radish leaves. It is also very easy to cook. Traditional gujarati methi thepla can be made using mooli or carrots or onions or a combinations of these for a change. We can use this thepla as a base for making interesting wraps and rolls. Fresh winter vegetables salad gives nice flavors to the palate and this salad has all christmas colors. It is also fresh, healthy and simple.